So, the date is Sunday, March 16, 1952. So glad we will be there together. March 21 - First reported Rock and roll riot breaks out at Alan Freed's Moondog Coronation Ball in Cleveland, Ohio. Teenage excitement is blamed for the frenzy. Most Played by Jockeys – ranked the most played songs on United States radio stations, as reported by radio disc jockeys and radio stations. Most Played in Jukeboxes – ranked the most played songs in jukeboxes across the United States. Johnny Ray dominated on the radio and in the stores from the beginning of the year with the song "Cry"
On May 17th, Leroy Anderson took over the top selling spot with his composition "Blue Tango"
around the world was Percy Faith's "Delicato"
by Clef Records in 1952. Off that album, I selected the song, "Easy To Love". it certainly must be....easy to love! Cool Daddy!Great tunes.That's the same year that I made my grand entrance into this world. 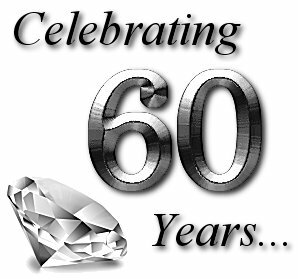 Sixty years!! Cheers to your folks! 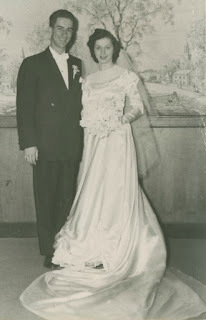 I hope that I am blessed with sixty years married to my best friend--may you all revel in the joy and love while you are together to celebrate. 60 years is indeed remarkable. I do believe congatulations are in order! Man, the music scene then was just ITCHING for some rock 'n' roll! Congratulations on a wonderful love story. I was 8 years old and these were some of my first memories of popular music. As luck would have it, today my blog ties in with the beginnings of rock and roll. Enjoy. Congratulations to your folks! Love the tunes and the tutelage that came along with them. Interesting to learn what was topping the charts just as rock and roll was breaking onto the scene. Happy Anniversary to your folks! A great achievement to be sure. 1952 - still twelve years before I came along. Out of the tunes you shared, the artist who has had the most lasting impact is the one was marginalized the most at the time: Billie Holiday. And her song was my favorite this week, although Delicado is a good one! Your parents look wonderfully happy and totally youthful as well! Congrats to them and so glad you all got to be together for the Big Event.